Can you confirm these amateur observations of Liolaemus monticola? Type locality: "Tal des Rio de San Francisco, ca. 1700m.". 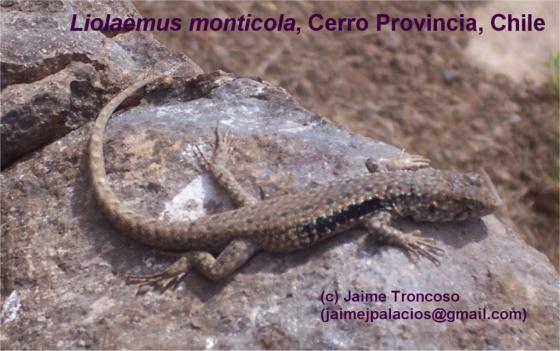 Comment Subspecies: Liolaemus monticola chillanensis and L. m. villaricensis are now treated as a valid species by most authors. Karyotype: Liolaemus monticola monticola exhibits extensive karyotypic variation along its latitudinal geographic distribution with chromosome numbers ranging from 2n = 32 - 46. Hellmich,W. 1938. Beiträge zur Kenntnis der Herpetofauna Chiles. XII. Die Eidechsen des Volcán Villa Rica (Sammlung Schröder). Zool. Anz. 124 (9-10): 237-242.